If you haven’t got a website, you may leave the building. Its okay, it’s okay. No one’s looking, no one will know. But please have one. And now it’s no good just having a website, it’s got to be good, it’s got to be effective. And good does not mean pretty, does not mean expensive. In my experience, the cheaper, the better. The simpler, the better. It’s the information and this is where most people get it wrong. Most people have websites designed to appeal to them, themselves. You are not your target customer. Your customer is your target customer. The website is for them. It’s not for you. And that’s what I keep talking about. So let’s assume that you’ve got one. How do you get people to come to your website because you need visitors that will helps enhance your efforts, if you’re going to be writing and generating content and things you want people to come and actually read the darn thing. Yes. That’s what it’s all about. So here’s some suggestions. Remember, in a recent weekend challenge on Friday, I gave you some things to think about for your website, in a challenge to look at it. And I said, is your content good? Do you offer things that they can’t just get from the BBC or from the New York Times or CNN or their websites. Because they are more likely to get it from them. They are not going to pick yours, given the choice. So what do you have? Well. You know stuff about your business. How about giving them information such as cheat sheets. So if somebody wants to do something, I mean you may be a landscape gardener. I’ve told you this before. You have to tell them everything you know. They will not go and do it. Have you seen Jamie Oliver and his cookery shows on TV? In the UK, he’s on all the time. And I think in America he’s been on various things. He has even done a Ted Talk. He’s much brighter than he sounds. But he is great. But he tells us how to cook stuff. He tells us all his recipes. He tells us exactly how to do it. Do this, do that. We can record them, we can go back to it over and over until we’re as good as him. But we still go and buy his books. He’s one of the biggest selling British authors of all time, currently. And we still go and eat in his restaurants. Why is that? It’s going to be the same in your business. Now if you’re going to say, ‘Oh my business is different.’ Yeah, say you are a landscape gardener, you say if I tell anyone how to do it, they’ll spend hours out there. They’ll buy the tools. They’ll dig, they’ll spend hours, get skips in and dig up. Put new lawn down and everything, they’ll do it all themselves. Who are you kidding? What’s the difference in your business? If you are a hairdresser in a beauty salon, are people going to cut their own hair? Or were you thinking, oh they’ll take that information and go to your competitor with it. Come on, have a little faith. Why are they at your place, in the first place, at your website? Don’t forget, you are an expert. You know stuff. And you’re good. Have some more confidence in your ability. You have a business, how long has your business been going? It’s been going because people like you. They didn’t go to your competitor. And the more information you give them, the more they know you are an expert. You are the authority. So give them a cheat sheet on how. If they are going to color their hair, how to look after hair color? Once it’s been applied. How about, how, if they are going to landscape gardener, how to care for your garden, once it’s been upgraded? And explain where you get them and how much they cost. And that they could go and buy them. But they are not going to go and buy expensive tools, they are going to use their iPhone. They are not going to, they are not coming to you for a portrait, or for studio photography. They are going to use their little iPhone, when they are out like here. So if you are a photographer. People are going to take photographs of thing like this. They are going to do it all day long. Why not help them? Why not show your expertise that demonstrates what an expert photographer you are? They are still not going to take their wedding photos on their iPhone. Are they? Those Sound Awesome! What Else Can I Add? How about books, recommended books to read. How about podcast to listen to? Again you are sending them to your competitor but you’re fine. You are going to have to trust me on this. There is a lot of evidence, you can read it, you can do whatever you like. But there’s lots of evidence that if you recommend other people, people infer that you are even above them. You can’t recommend yourself, its inferred. But they take that. They trust you. If you are so confident that you can say, ‘Oh, go check out our competitor’, they will think, you must be wonderful. It really is the way it works. How about apps? How about recommending apps they can use. All these things, and put this on your website. Now email people and say, ‘We’ve just got this new report on the best apps to use to do this. We’ve got this new report on 5 tips on how to use your iPhone like a pro.’ We have this on our website. And these emails can be sent just directly as email blast, but even better. Set them up on auto responder, to the list you’ve been building and these create added value expert content that goes to them 24/7 on a schedule without any, any touch points from yourself. You don’t have to do anything other than set it up in the first place. Once these things are set up, they are a beautiful thing. And It just gets you web visitors to your website and then they see the glory of who you are and what you can do. Honestly. That’s how it works. It works. Really, really, it works. So it’s Monday. Time for a Book for the Week. 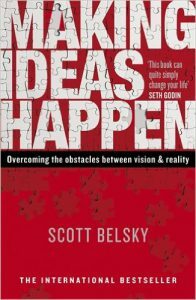 Today, going to talk about a book called, Making Ideas Happen. 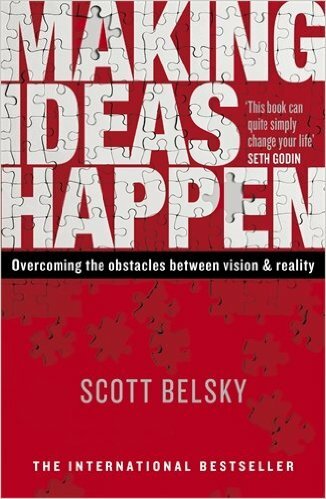 It’s by Scott Belsky. Entrepreneurs and business leaders and successful people create ideas. They come up with ideas. They think all day long, they come up with ideas. but the real successful ones actually make the ideas happen. And that, you can’t teach someone to come up with ideas but you can teach someone to do them. He’s studied tons of successful people. It’s brilliant, it’s a really really good book. You’ll find it on Amazon, whatever. Now if you want this book for free, from me, at my expense, delivered to you anywhere in the world, honestly, genuinely free. Coming from amazon or one of the book depositories, amazon subsidiary. Just go to www.MarketingForOwners.com/freebook and see what you have to do, to get one. Dead easy. Doesn’t cost you a penny. Okay. I will see you tomorrow.